It’s the first day of my 12 Days of Christmas Holiday Series! Please welcome Devin, from Nom Yum & Free! Devin is a wife and full-time working mom of a 4-year son and 1-year old daughter. If that isn’t enough, she spends (what should be her sleeping) hours creating yummy allergen-free recipes to share with others. *Since this post was written, Devin’s blog was hacked and has been taken down. I have unlinked her links to her blog so that they don’t take you to Never Never Land. The links to her social media still work. We’ll miss Devin’s great recipes, but you can still find her yummy gluten free peppermint ganache cupcakes right here. Nom Yum & Free has pages of allergy-friendly mouth-watering foods and beautiful baked treats inspired by Devin’s love for her daughter even more than her love for eating. After a midnight scare (when her newborn’s eyes swelled shut), Devin learned that her daughter had multiple food allergies. She created Nom Yum & Free when she had difficulty finding many safe (but yummy) foods to eat without causing repeat allergic reactions in her nursing daughter. 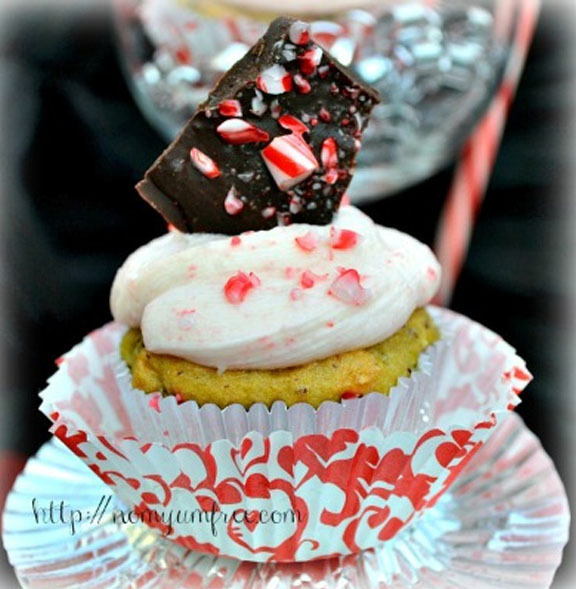 In the Christmas spirit and because I LOVE cupcakes, I am sharing a wintry fresh recipe for peppermint candy cane cupcakes with chocolate peppermint ganache filling. Beyond just being gluten-free, this recipe is vegan and free of the top 8 most common food allergens (gluten, dairy, egg, soy, tree nuts, peanuts, fish, and shellfish). This allergy-friendly Christmas cupcake unites a soft moist vanilla cupcake (with a hint of peppermint), the wintery cool of a homemade chocolate peppermint ganache filling, and a light melt-in-your-mouth buttercream frosting with fresh bursts of candy cane flavor. For added Christmas décor, top your cupcakes with a delicious, easy-to-make allergen-free chocolate peppermint bark. What makes this the perfect Christmas cupcake? It easily adapts to the wishes of all your holiday guests! Everyone from the ultimate chocolate lover (e.g., my mom who would love a chocolate peppermint ganache-filled cupcake with a bit of cocoa powder in the batter) to those who wouldn’t touch chocolate with a stick (e.g., my son whose favorite is sans filling but loaded with candy cane buttercream) will enjoy the many combinations. Easily convert this recipe to yummy allergy friendly stocking stuffers! * For even more holiday flavor, I have even used ⅓ cup So Delicious Nog mixed with ⅔ cup of So Delicious vanilla coconut milk. Line a 12 cup muffin pan with cupcake liners and preheat oven to 350° F. Whisk together flours, xanthan gum, baking powder, baking soda, and salt. (For the ultimate chocolate lover, you can add 2 tbsp. of unsweetened cocoa powder to make a chocolate cupcake.) Set aside dry ingredients mixture. Stir lemon juice into milk and set aside (coconut milk should curdle some). Set aside. In a small saucepan, stir together flax seeds and water. Heat mixture on stove over high heat until it begins to boil. Then, lower temperature to medium high heat and continue to cook for another 2 minutes. Cooked mixture will resemble the texture of egg whites. Set aside. Use a hand mixer or electric mixer on medium speed to beat together oil and sugar until fluffy (about 1 minute). Beat in vanilla and peppermint extracts. Add flax seeds mixture in 2 parts, beating well after each addition. On low speed, add milk mixture. Then add flour in 3 parts, beating well after each addition until batter is combined. Use a spatula to scrape sides of bowl after each addition and make sure ingredients are well combined. Use a medium cookie scoop to fill each cupcake liner about ⅔ to ¾ of the way full. Bake in preheated oven for 18-20 minutes, until a toothpick entered in the center of a cupcake comes out clean. Remove muffin pan from oven and let cupcakes cool in pan on a cooling rack for 10 minutes. Then remove cupcakes from pan and place on cooling rack to cool completely. ** IMPORTANT: Be sure to check candy cane labels or with the manufacturer regarding allergens. I used naturally flavored Spangler candy canes, which are top 8 allergen free but have dye and report to have a “trace amount” of soy oil (with all proteins removed) in the lubricant in its cooking kettles. Next time, I may try these natural, dye free, allergen-free candy canes available online. Lightly crush candy canes in a blender or food processor. Reserve about 2 ½ tbsp. of roughly crushed pieces and flakes, and set aside for garnishing finished cupcakes. Puree remaining candy canes into super fine flakes – powder. Note: This recipe makes quite a bit of icing, so you likely will have some remaining after frosting your cupcakes. 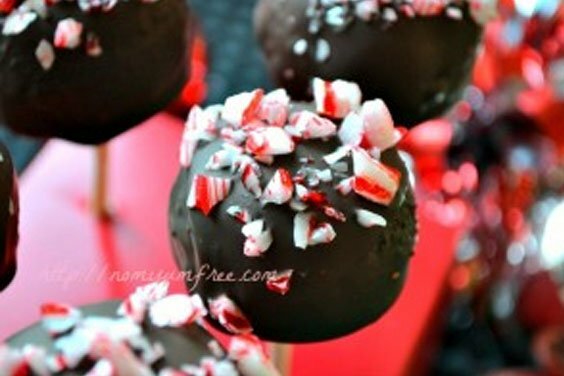 You can freeze the excess or use it in some chocolate peppermint candy cane cake pops. On medium-high speed, use an electric hand beater or mixer to beat together shortening and buttery spread until fluffy (about 1 minute). On low speed, add ½ the sugar and beat until fluffy (about 1 ½ minutes). Add vanilla extract and milk, and then beat to combine (about 1 minute). Beat in remaining sugar on low speed. On high speed, beat frosting until light and fluffy (about 5 minutes). Add reserved candy cane “powder” and continue beating on high for 1 minute. Again, I invite you to come over to Nom Yum & Free to pick up today’s simple allergen free peppermint bark recipe (good for topping your candy cane cupcakes or enjoying as is). 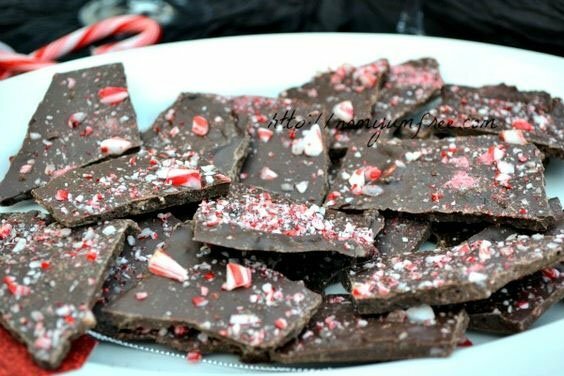 That chocolate peppermint bark looks yummy! I left link #3 for a recipe for Baked Pumpkin Oatmeal and a giveaway of Festive Traditions: A Real Food Guide to the Holidays. Thanks! And what makes it even more enjoyable is how easy it is it make this top 8 allergen free treat! This week I have shared my cold and flu busting coconut and orange smoothie. You’ll find this gorgeous drink will help you recover in no time. Hi Heidi! Thanks for hosting! There will be lots of great recipes for Christmas! This week I shared my Salted Toffee Chocolate. Thanks again so much for letting me help you kick off your fun 12 Days of Christmas Holiday Series and Group Giveaway event! I can’t wait to come back to see what’s in store for the rest of the series. “See” you tomorrow for Day 2! That cupcake looks divine!!! I’m linking up GF Spaghetti and Spicy Meatballs and Vegan GF cookies for dessert. Have a great week! Thanks for hosting and for the give-away! :) Fun times, for sure! Thanks Heidi for this fun build-up to the holidays! And Devin, this recipe looks amazing! 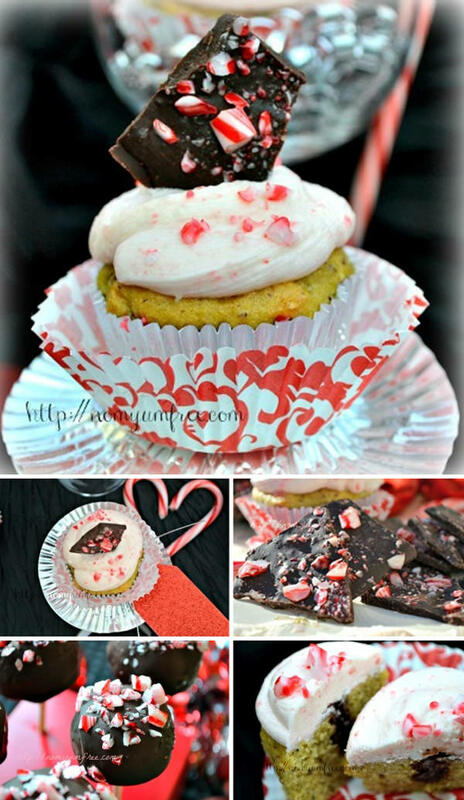 I love all things candy cane and can’t to give this a try :) What a gorgeous looking cupcake. As to your question, I’m not sure what I’m most excited about giving this Christmas… I guess what it would probably have to be my time and gifts to others in general. To see someone else light up…that’s just amazing. :) I love giving and sharing with other people. It is definitely better to give than to recieve. This week I’ve shared a recipe for allergy free miniature apple pies in honour of National Apple Pie Day! Hi Danielle – Thanks so much for your kind words and compliment. I agree, I can’t wait to see what else is in store for the rest of the 12 Days of Christmas!! Your pies look so yummy! Heidi, Thanks so much for continuing to host the Gluten Free Monday. I always find new recipes to try but I’m especially delighted to see the beautiful cupcakes created by Devin–chocolate and peppermint is one of my favorite combinations. I’m sure these taste as amazing as they look. Thanks so much for your kind words! As you can see from the collage of photos, I’m loving the chocolate-peppermint combination this season! Everyone I shared the pictured treats with told me they surprisingly tasted even better than they looked — and that the cake pops would fool anyone into thinking they were free of the top 8 most common food allergens. :) Hopefully, you’ll think the same if you happen to try them. I can’t wait to see my granddaughters face when she receives her Monster High dolls. Devin….those cupcakes are beautiful looking! I can tell you spent a lot of time on that recipe. Photos gorgeous too! I’m not sure what I am most excited to give this year….probably my daughter’s present of Calico Critters house and family. Hi Peggy!! Thanks so much for your compliments regarding the cupcakes and photos. I was a bit worried about the photos because I was stuck taking pictures at dusk with consecutive days of overcast skies. But nice to hear you thought they came out well. Again, your donuts look amazing. Hope to try them soon! Thanks for hosting this linky party! I am sharing my gingerbread donuts with cinnamon buttercream frosting. They are free of the top 8 food allergens and simply delicious! This looks wonderful! I am saving this recipe for my gluten free friends! Thank you Nom Yum & Free for sharing this wonderful recipe and thank you Heidi for hosting! Have a wonderful day! I really hope you and your gluten free friends enjoy these cupcakes as much as we did. Come to think of it, everyone I shared them with usually don’t eat gluten free – so may be a recipe for any of your friends. ;) Have a great week!! I am very excited for Christmas, cuz this year i have made a lot of the gifts to give! Thanks for visiting Caroline. I think that’s the best Christmas! I love making gifts, too. Great post Devin. Those look so yummy! Months later and I just saw your comment. :) Happy National Pancake week!! ;) Thanks for the compliment last year! Anything gluten-free and peppermint has me hooked — any time of year — not just the holidays. Thanks! I love your cupcakes. I pinned them they were so pretty! My link today is a Pennsylvania Dutch Apple Tart recipe that my mother-in-law taught me… It’s the gluten-free version. I hope everyone loves it! Hi Pat. Thanks so much for your compliment regarding my cupcakes!! And many were surprised to find they tasted better than they look. Would love to know what you think should you try them – please stop by my site and let me know. And your recipe looks delicious – I love anything apple! !